Dr. Ying Li, MD, PhD, newly promoted Professor of Nephrology, and former WISER Simulation Fellow was recently promoted to Vice Director, Clinical Skills Training Center of the second Xiangya Hospital in Changsha, China in the Hunan Province. Dr. Li served as a WISER Simulation Fellow in 2011 and 2012 studying elements of simulation-based curriculum design and simulation center operations, with a focus on large center solutions. 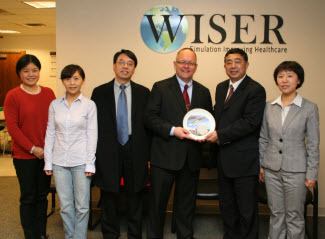 Dr. Li recently visited WISER accompanying leadership from the Xiangya Hospital and the Central South University, School of Medicine. She gave a presentation outlining her experiences and immersive studies at WISER that contribute directly to her being selected for the position as well as giving her the experiences to be successful as the "Captain of the Ship" of a brand-new large, multidisciplinary, clinical skills training center that will serve the needs of both hospital and the school of medicine. Dr. Zhimin Xue, Vice President, Second Xiangya Hospital, presented a commemorative plate from the hospital, to WISER, in appreciation for the educational opportunities, immersive learning environment, and preparation of Dr Li for her new post. We congratulate Dr. Li on her recent promotion and look forward to continuing our collaborations with Xiangya Hospital and the Central South University.